Have you ever used Greek yogurt instead of sour cream in dips, soups, salads, pie and other dishes? With its creamy texture and rich flavor, Greek yogurt can turn any meal into a feast. Along with sour cream, it's a favorite choice for low-carb dieters. The difference between sour cream and yogurt, though, goes beyond their fat content; each product has its own nutritional profile and offers unique benefits. Greek yogurt is one of the few superfoods that lives up to the claims. It's tasty and filling, packing a hefty nutritional punch. Sour cream tastes just as good, but it's higher in fat and calories. Despite their similarities, these foods have distinctive properties. First of all, Greek yogurt is made from milk and live cultures, such as Lactobacillus helveticus, Lactobacillus lactis and Streptococcus thermophilus. These bacteria ferment the milk, giving it a tangy taste; afterward, the milk is incubated for several hours, and the liquid whey is removed. Sour cream, on the other hand, is made by adding bacterial cultures to pasteurized cream with at least 18 percent fat. Next, the cream is re-pasteurized to destroy the bacteria and stop fermentation. Manufacturers often add salt, sodium citrate, flavoring agents, gelatin and other additives to increase its shelf life and boost its flavor. When Greek yogurt is strained, some of its lactose, water and salt are removed. What's left is a thick casein-rich paste that preserves beneficial bacteria. Greek yogurt calories depend on its fat content. Whole-milk varieties deliver approximately 220 calories, 20 grams of protein, 9 grams of carbs, 11 grams of fat and 30 milligrams of cholesterol. Flavored varieties are higher in sugar and carbs. Beware that Greek-style yogurt is not the same as the original product as it has a different composition and lower nutritional value. This creamy food is also rich in zinc, magnesium, iron, potassium, vitamin B12, vitamin A and riboflavin. Greek yogurt contains some of these micronutrients too, but in slightly smaller amounts. If you're trying to cut back on calories, opt for fat-free sour cream. It doesn't taste as great as the regular version but has a lower calorie content. One cup provides 7.1 grams of protein, 26 grams of carbs, 21 milligrams of cholesterol and only 170 calories. The difference between sour cream and yogurt is quite obvious. Greek yogurt is higher in protein and lower in fat and cholesterol. It also contains probiotics that balance the gut flora and may improve digestive health. According to a 2016 clinical trial published in Nutritional Neuroscience, probiotic yogurt may improve mental health. Regular yogurt doesn't exhibit these properties. 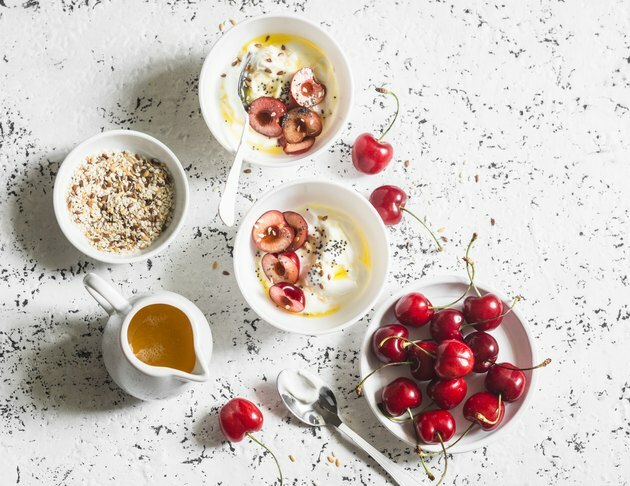 Another study, featured in the journal Brain, Behavior, and Immunity in 2015, found that multispecies probiotics, such as those found in Greek yogurt, can lift your mood and reduce feelings of sadness. Research also suggests that frequent yogurt consumption may improve metabolic health and protect against diabetes. This food has been linked to lower rates of obesity, heart disease and tooth erosion. Due to its high protein content, Greek yogurt can make it easier to lose weight and keep the pounds off. This fermented dairy food does a lot more than just add flavor to your meals. It's an excellent source of calcium, magnesium, selenium, potassium, vitamin A and B-complex vitamins. Despite its high fat content, sour cream might actually help you get leaner and boost your health. A 2016 study published in The American Journal of Clinical Nutrition shows that high-fat dairy foods may lower the risk of gaining weight over the years. Researchers attribute these findings to the large amounts of calcium, phosphorus, protein and vitamin D in whole milk and its derivatives. Women who consumed these foods gained less weight in the long run compared to those eating low-fat dairy. Additionally, some varieties of sour cream contain probiotics. Manufacturers usually mention it on the label. Look for terms like "active cultures," "live cultures" or "Acidophilus and Bifidus cultures." Both Greek yogurt and sour cream are high in calcium. This mineral promotes bone health and plays a key role in muscle, nerve and cardiovascular function. It also contributes to hormonal secretion and bone formation. According to the National Institutes of Health, a diet low in calcium may lead to osteoporosis and bone fractures over the years. The risk is higher among postmenopausal women, female athletes, vegetarians and people with lactose intolerance. Additionally, certain lifestyle factors, such as heavy caffeine consumption and high-sodium diets, may reduce calcium absorption and increase its excretion. Adding sour cream and Greek yogurt to your meals may help prevent calcium deficiency. Your body needs this mineral to build strong bones and function at its peak. Greek yogurt is lower in lactose than regular yogurt and sour cream, so it's less likely to cause adverse reactions in those with lactose intolerance. The probiotics in Greek yogurt and sour cream can help restore the gut flora and improve digestion. The bacteria living in your gut support immune function, hormone and enzyme production, nutrient metabolism and digestive health. According to a recent study published in the journal Immunity in 2018, microbiota (good gut bacteria) regulates immune function and improves the body's ability to fight pathogens. At the same time, it reduces inflammation, offsetting its harmful effects on the gut. As you see, it's hard to tell who wins the sour cream vs. Greek yogurt debate because both products benefit your health. Choosing one over another comes down to your preferences. Greek yogurt, though, packs more protein and less fat. Consider using it as a substitute for sour cream in sauces, dressings, baked goods, pound cakes coffee cakes, baked potatoes, meat dishes and other homemade meals.